Canadians should leave Yemen as soon as possible, the Department of Foreign Affairs reiterates Sunday, as new political violence sweeps the Middle Eastern nation. Canadians should leave Yemen as soon as possible, the Department of Foreign Affairs reiterated Sunday, as new political violence swept the Middle Eastern nation. In an update of an earlier warning to travellers, Foreign Affairs urged Canadians to use commercial transportation links to leave the Middle Eastern country, which has been caught up in the political turmoil sweeping the region since mid-February. A similar warning was issued to Americans on Sunday. Canadians should avoid political gatherings, crowds and demonstrations, which can turn violent without warning, the advisory said. Canadian officials may not be in a position to provide consular assistance to Canadians in some parts of the country — mostly outside urban areas — because of security concerns, the travel warning added. In addition, Canadian officials may not be able to provide assistance in areas where the government of Yemen prohibits entry or requires permission in advance for entry. The travel advisories came amid another day of violent protest in Yemen. 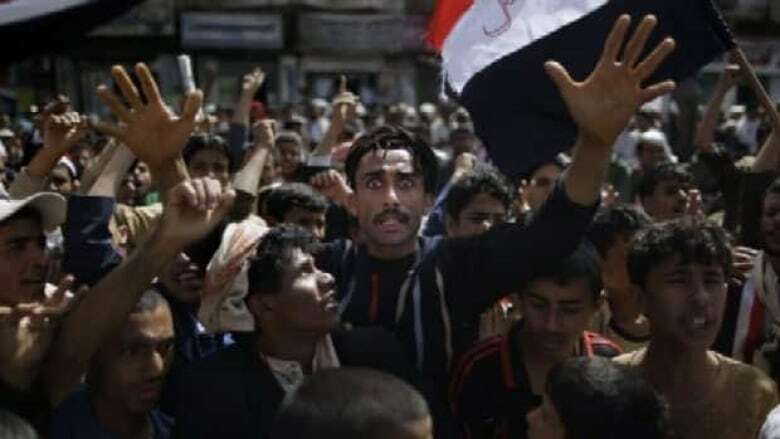 Government supporters wielding knives and handguns attacked protesters on Sunday, leaving one person dead in the latest demonstrations demanding President Ali Abdullah Saleh step down after 32 years in power. In a separate development, suspected al-Qaeda gunmen killed four soldiers from the government's elite Republican Guard forces in a mountainous region.